Select a building to view more information and details. The Mill Building | Phase 1 will be comprised of 1 and 2 bedroom lofts available for lease in February 2016. The Mill Building | Phase 2 will be comprised of 1 and 2 bedroom lofts available for lease in March 2016. 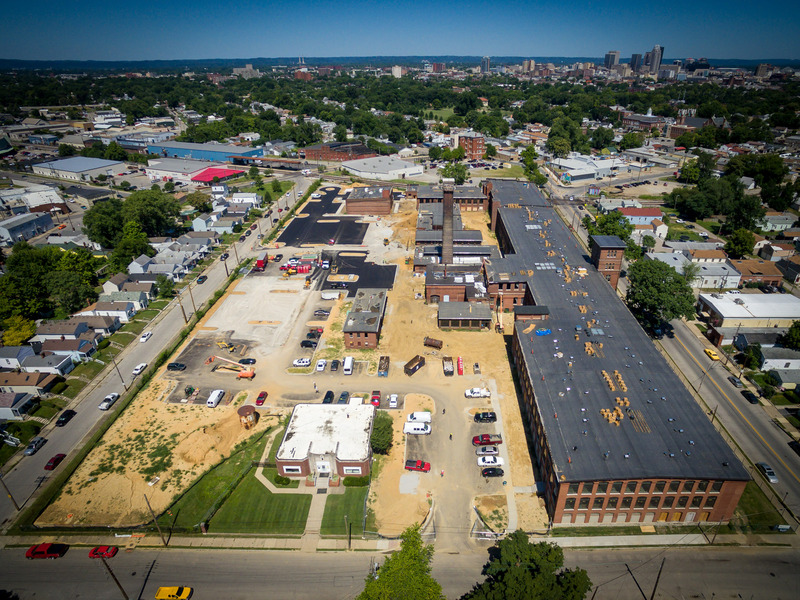 The Mill and Picker Building | Phase 3 will be comprised of 1 and 2 bedroom lofts available for lease in April 2016. Finn's Southern Kitchen opens March 2016. The Shop consists of 3,600 square feet of commercial space available for lease. The Machine Shop will feature a Flex Appeal Fitness Studio opening March 2016. The Engine Room will be comprised of 1 and 2 bedroom lofts available for lease in Winter 2016. The Boiler Room will feature a Flex Appeal Fitness Gym opening March 2016. The Dye House will be comprised of 1 and 2 bedroom lofts available for lease in Winter 2016. The Waste Mill consists of 4,500-7,500 square feet of commercial space available for lease. The Waste Mill will be comprised of 2 bedroom lofts available for lease in Winter 2016. The Warehouse will be comprised of studio and 1 bedroom lofts available for lease in November 2015. Future location of swimming pool and grilling area. Construction phase image as of August 2015.